Germs are as common in schools as the ABCs and 123s. And, with so many kids together in one place, those germs are sure to be shared. Fortunately, there are many steps you and your child can take to help stop illness in its tracks. From food poisoning to the flu, the following tips can help your child stay a little healthier this year. Make sure your child is up-to-date on immunizations. At your child's next doctor visit, find out which vaccines are needed. Some shots are needed only once or twice in a lifetime. Others are needed more often. The flu vaccine, for instance, is needed every year. 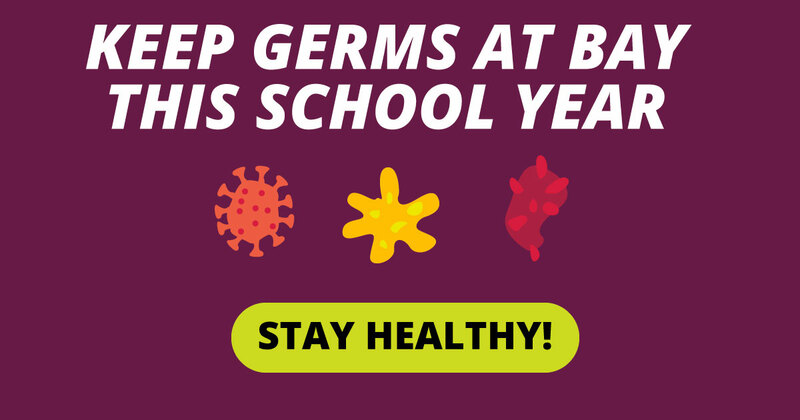 Handwashing is the best way to prevent the spread of germs. Remind your kids that they need to wash their hands after using the bathroom, before eating, after blowing their noses and after playing. Scrubbing hands with soap and rinsing with warm water for at least 20 seconds is best. But an alcohol-based sanitizer will do the trick when water isn't available. Your child's lunch can be a source of some really nasty germs that cause foodborne illness. And, in this case, prevention starts at home. Keep cold foods cold and hot foods hot by using an insulated lunch bag. Or use ice packs to keep lunch goodies cool. Put hot foods in a thermos to keep them warm. Wash fruits and veggies before packing them up. And wash out lunch boxes and food containers every day. Don't reuse disposable packaging—it can spread bacteria. Kids may be used to swapping and sharing food, utensils and drinks at lunchtime. Or they may pass the water bottle around at practice. Unfortunately, all this sharing can pass germs around too. Remind your kids to keep their lunch items, water bottles, etc., to themselves. Bacteria thrive in the moist, close conditions of the locker room. And the close-contact nature of athletics gives germs a prime opportunity to spread. Infections such as MRSA (methicillin-resistant Staphylococcus aureus), the antibiotic-resistant superbug, can make the rounds in short order. Remind your athlete never to share personal items such as towels or razors. Washing hands or using sanitizer before and after workouts can help eliminate infections. Red bumps that resemble spider bites are signs of MRSA. They may be swollen, painful, warm to the touch, or full of pus. Quick treatment can keep the problem from getting worse. First and foremost, your child should stay home if they're very sick. If your child is well enough to go out, remind them to use a tissue to cover coughs and sneezes—or cough into their elbow if no tissues are available. And make sure they keep washing those hands! Our School Health topic center is packed with more information about staying well during the school year.